A comprehensive tutor for the Irish folk harp, taking the beginner from simple basics to accomplished playing of well-known Irish airs. The student will progress from simple nursery rhymes and excercises to well-known traditional Irish airs and songs, including 'Brian Boru's March', 'The Lark in the Clear Air', 'Carrickfergus' and many more. Years of teaching experience have taught me that the best age to begin studying the Irish Harp is from eight to ten years old. The harp is a large instrument for small players to control. It is a great advantage for intending harpists to have had at least one year’s tuftion at the piano, before studying the harp, so that they are already familiar with the Treble and Bass clefs, simple music notation and time signatures. 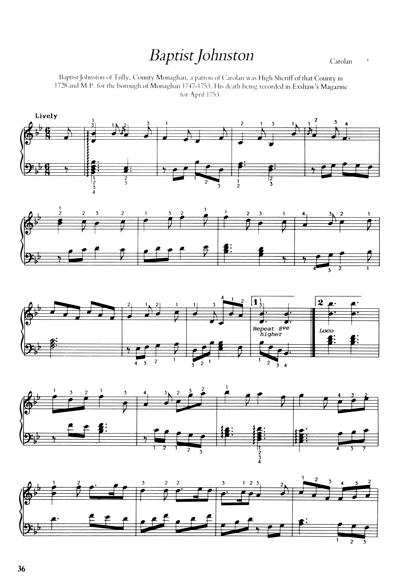 Quicker progress can be ensured then by starting the very young child of five or six on the piano before turning to begin the harp when they are big enough to control it. Most harp lessons are of thirty minutes duration weekly in which the student must learn a combination of technique, music theory, aural training and a good position at the harp - all of which are necessary to become a good musician. This elementary tutor is written in as simple a style as I could find and I have set out to cover approximately the first two years of study. There is a lot more to learn about the Irish Harp, or Folk Harp or Non-Pedal Harp as it is sometimes called, such as Glissandi, and Repertoire, but the beginner should find ample material here. 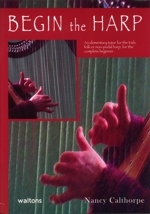 For players wishing to study the Concert Harp, initial training in the Irish Harp is very valuable as the finger technique is the same for both. 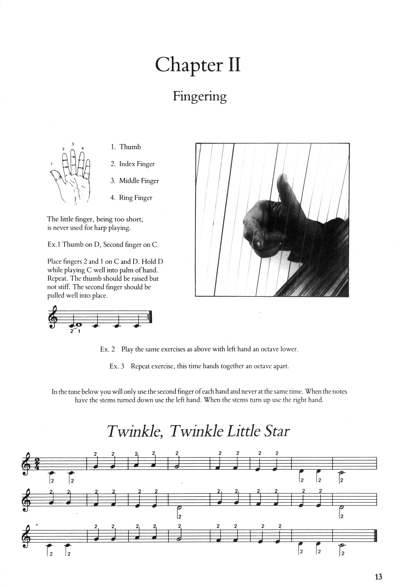 You will need a stronger pull for the“Big Harp” however and you will also have to learn the difficult pedal technique. Nevertheless you are halfway there if you can become a good Irish Harpist. It gives me great pleasure to write a few words of introduction to this new tutor for beginners on the Irish harp. Interest in the national instrument has grown amazingly in the last decade or so and the Irish harp is now firmly established with its own repertoire rooted in traditional music. This tutor is a very welcome and necessary addition to the published literature and teachers and pupils can all say ‘thank you’ to Nancy Calthorpe for bringing us to more enjoyment and love of the Irish harp and its music.